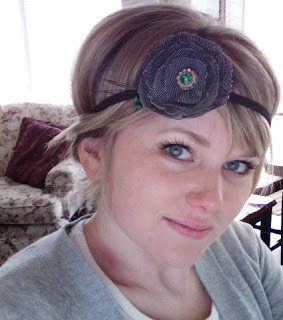 i am obsessed with certain headbands lately. i say "certain" because i do not mean all. 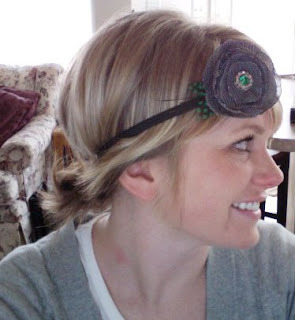 the last time i decided i was completely in love with a certain headband was the day i went to "some guy's flea market" and found my new fave headband-maker. well. "some guy's flea market" came 'round again and i guess i couldn't resist! p.s. jason really likes them too. when i put this baby on to show him he surprised me and LOVED it. there was a girl from our ward at the booth with me. her husband told her to pull the flower down a bit and she could pretend she was a pirate. CUTE!! I've been wanting to go to that flea market but, I'm a slacker! Now I'll definitely have to go if they have cute things like that! Any headband on you, Ger, would be darling. i love them too! emily took me to the flea market on saturday and i bought two. i'm going back next weekend to buy another and get one for my sister. too bad the girl is moving away in a few weeks! I am surprised that you're taken with feathers....We need to check you for Indian blood. so cute! i'm wondering if i could pull this off with my short hair...they seem to be sort of a long haired thing. hmmm.